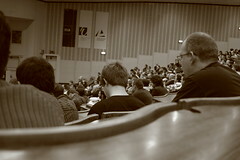 I have been to the FOSDEM 2007 this Saturday, a great free software event. I won't talk about the event itself but about the move I saw from FFII regarding the patents. They started a new initiative called ethipat in order to promote the creation of a new ethical patent system. The discriminations exposed on the ethipat website are shared by all the opponents of software patents. I would like to sign their pledge but there is something important that we should keep in mind. Why do we want to continue in a 'patent system' ? Why not simply improving the use of an open publication scheme for the industry ? Software is covered by copyright and authors'rights why not better excluding software from the patent system. and promoting the use of authors'rights in the perspective of innovation and its metric. The main advantage of copyright is its very low cost and its automatic assignment. Why not improving a registration process of copyright and authors'rights (for SME, large companies or individual authors) that could be used as a better metric, an open publication scheme and help to reduce the volume of orphan works. I fully agree with FFII regarding the current situation of the patent system… but is it worth to invest in another broken patent system ? Update 2007 03 04 : FFII has posted a clarification about the ethical patent campaign. I agree on the point regarding that the disclosure process in the patent system is not working. Every programmer knows that's often impossible to implement anything from a patent description as it is often rewritten by lawyers. But jumping in the patent system for building a new patent system based on general good principle is dangerous just because not all the players in the patent are playing fair. Promoting existing authors rights as an industrial measure and metric for innovation looks more useful in my eyes. I hope that FFII will clearly state in their campaign that software/computer programs are only protected by the authors rights /copyright and not by the broken patent system.